Not much remains of Euclid Beach amusement park at its former location in Cleveland's Collinwood neighborhood. Sure, nostalgia seekers know that Laughing Sal often makes appearances at local events, the rocket cars are regularly seen driving around town, and Humphrey popcorn balls and candy kisses can be found in nearly every area supermarket, but the actual location of their childhood memories is merely a shell of its former self. Parts of the concrete pier remain, but are crumbling. A tree-lined walkway still overlooks Lake Erie, but the water is polluted, and the beaches are often covered in driftwood and garbage. High-rise apartment buildings and their expansive parking lots fill much of the rest of the old park space. 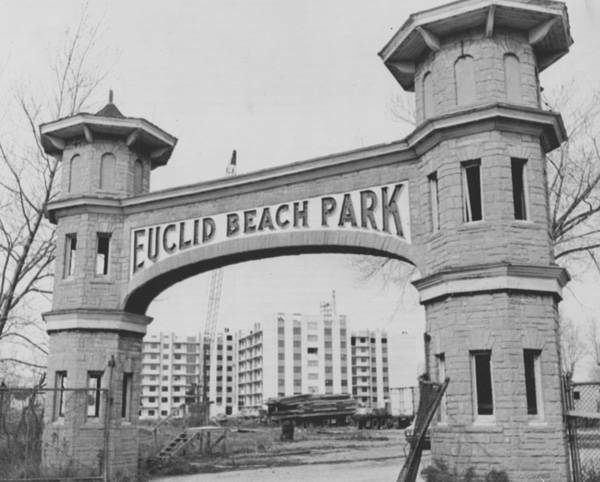 One thing has not changed, however: the Euclid Beach arch still stands in all its grandeur at the park's old entrance on Lakeshore Boulevard, a solitary reminder of the nearly 70 years of fun that took place there. 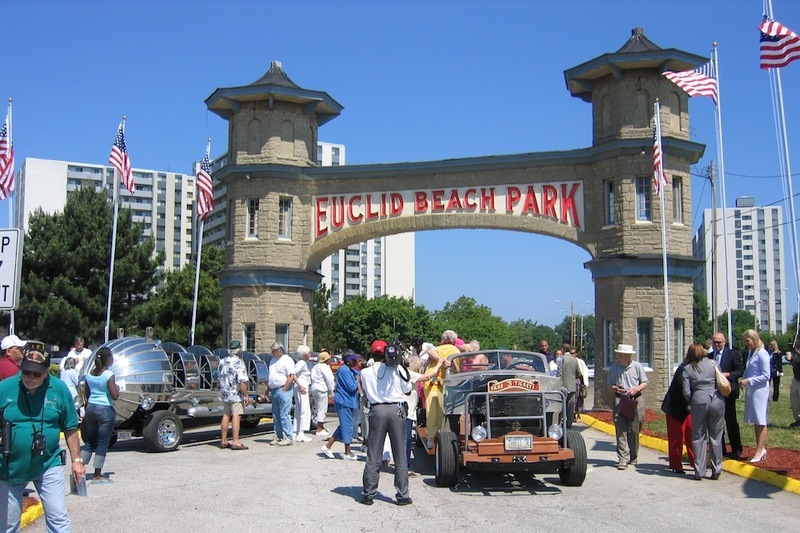 The Euclid Beach arch was built in the 1920s. Before then, a shorter, more modest arch welcomed patrons to the park. In a way, the wide-open, welcoming look of the arch is symbolic of the kind of amusement park the Humphrey family created when they took over Euclid Beach in 1901. 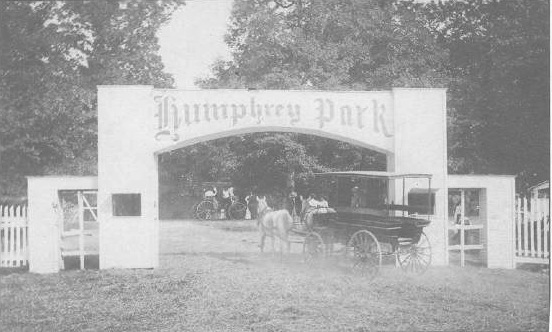 In contrast to many other parks at the time, the Humphrey's instituted a 'free gate' system. It cost nothing to enter Euclid Beach; patrons could spend as little or as much as they wanted on rides and concessions. In contrast, the original operators of Euclid Beach charged an entry fee, and also erected high, opaque walls that blocked views of the rowdy activities taking place inside - drinking, gambling, freak shows, and the like. The Humphrey's Euclid Beach, on the other hand, would be a family-friendly place where the rich and poor alike could enjoy good, clean fun. Since Euclid Beach Park closed in 1969, the arch has elicited mixed emotions from those passing by on Lakeshore Boulevard. For some, it rekindles pleasant memories of the past, but others find it hard to lay eyes on the arch, seeing it as a symbol of something lost. Nonetheless, the arch remains in place as an official City of Cleveland Landmark. 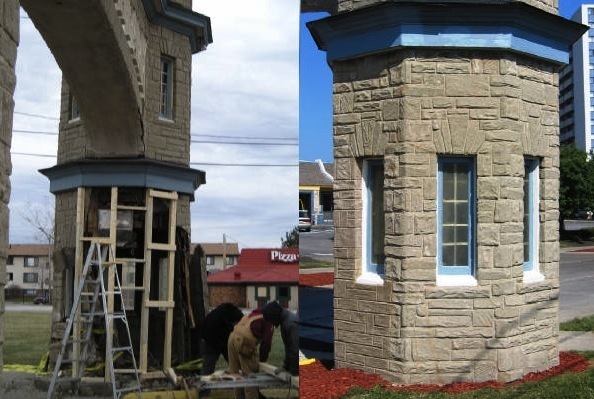 It even survived being hit by a car in 2007, and has since been renovated and reenforced. Amidst a sea of strip malls, high-rise apartment buildings, and beaches unfit for swimming, the arch is certainly an anomaly. Perhaps that is why it remains dear to so many - even those too young to have visited Euclid Beach themselves. Postcard: Both towers of the arch have a door on their back side. Permanent wooden ladders are along one wall of each tower, which pass through an opening in the first floor ceiling to allow access to the interior of the centerpiece. Originally a number of incandescent bulbs were used to illuminate the letters spelling out 'Euclid Beach Park.' They were later converted to neon; the wiring insulators are still inside the crosspiece. Around 1942, a contractor was hired to install stone covering called 'Permastone' to the outside of the arch, giving it its present look. Image Courtesy of Cleveland State University. Michael Schwartz Library. Division of Special Collections. Cleveland Press Collection. 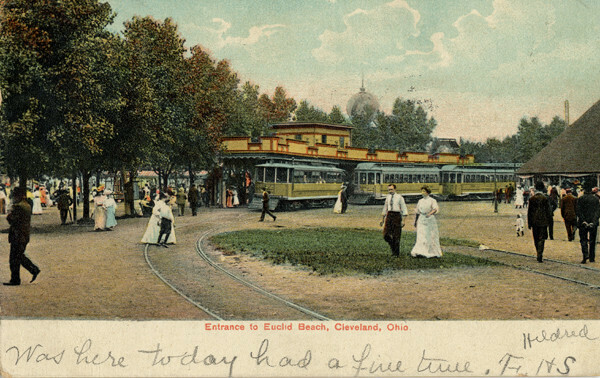 Streetcar Station, 1907: Visitors who took the streetcar to Euclid Beach arrived at this station, just to the east of the arch, where another entrance to the park was located. 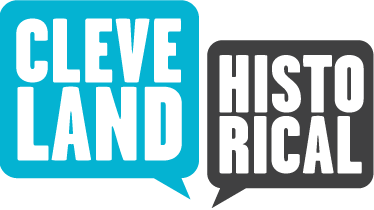 Image Courtesy of Cleveland State University. Michael Schwartz Library. Division of Special Collections. Cleveland Press Collection. 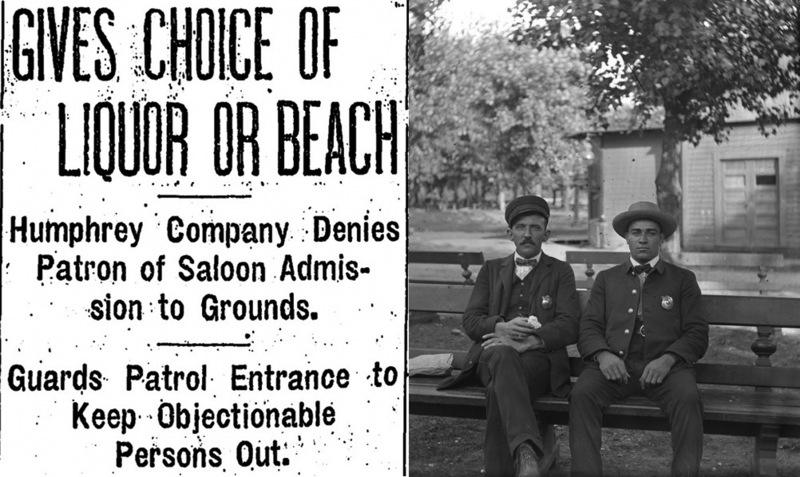 'Liquor or Beach': Alcohol was strictly prohibited at Euclid Beach after the Puritanical Humphrey family took over the park in 1901. Even those who had been drinking elsewhere were not allowed in, as shown in this headline from the Cleveland Plain Dealer in 1909. The Euclid Beach Park Police (two of whom can be seen on the right) patrolled the area around the arch to enforce this rule and keep intoxicated people from entering. Image Courtesy of Cleveland State University. Michael Schwartz Library. Division of Special Collections. Cleveland Press Collection. New and Old, ca. 1970s: The Euclid Beach arch sits in a state of disrepair as apartment towers are built on the site of the closed amusement park in the early 1970s. Image Courtesy of Cleveland State University. Michael Schwartz Library. Division of Special Collections. Cleveland Press Collection. 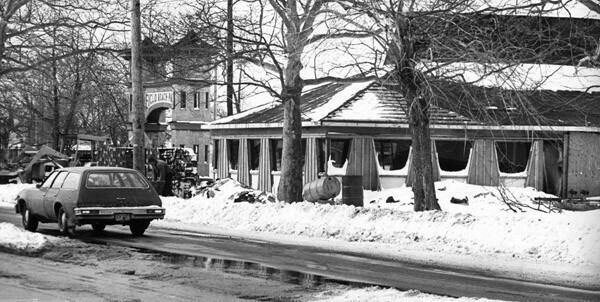 Lakeshore Blvd., 1978: The arch sits next to a Pizza Hut restaurant on a snowy Lakeshore Boulevard in 1978. Image Courtesy of Cleveland State University. Michael Schwartz Library. Division of Special Collections. Cleveland Press Collection. Jim Seman describes how he would avoid driving past the Euclid Beach Arch in the years after the park closed. 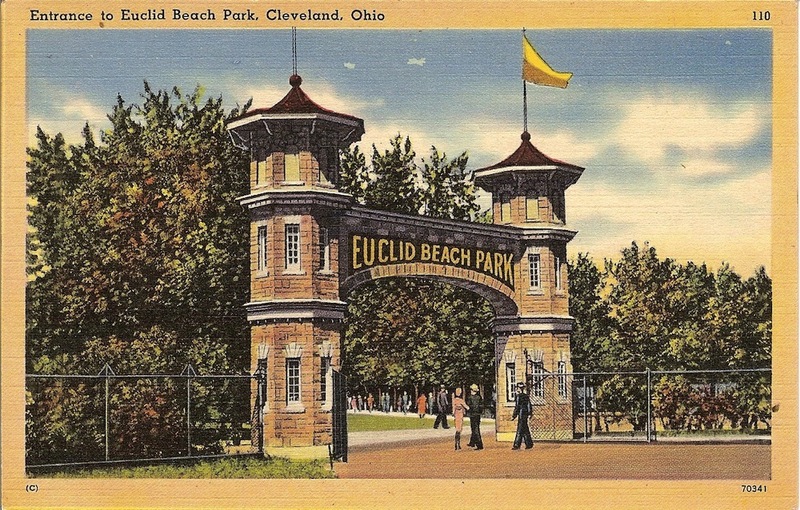 Euclid Beach Park Now and Michael Rotman, “Euclid Beach Park Arch,” Cleveland Historical, accessed April 18, 2019, https://clevelandhistorical.org/items/show/530.